A Celtic Christian garden is being created in the car park of the Poor Clare Convent in Dublin for the World Meeting of Families. 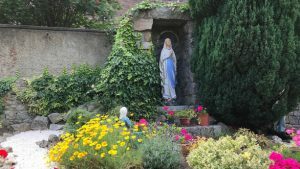 Skilled craftspeople such as stone-cutter Philip O’Neill and sculptor Imogen Stuart have prepared a holy well and sculptures for the garden, in Saint Damian’s Monastery, Simmonscourt Road, near the RDS, as well as elsewhere in the RDS. The holy well is named after St Broc, which means “badger” in Gaelic. The Irish St Broc lived in the eighth century and was one of the seven daughters of Dallbhronach in Deece, Co Meath. She founded a monastery on the city side of the Dodder River in nearby Donnybrook; in Gaelic this place name is Domhnach Broc, meaning the Church of Broc. The holy well is made from ancient Irish granite which reflects the history of St Broc and the longevity of Irish holy wells. 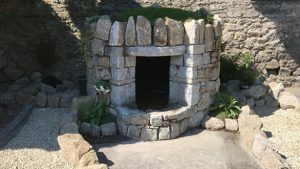 The organisers of the garden said the Poor Clare Sisters decided that the well should become a permanent fixture. “It is arousing great interest and may soon become a place of veneration and prayer. The fact that St Broc was female is a happy surprise for many, in a period when the complementarity of women in the Church is slowly being acknowledged,” said a spokesperson for the organisers, who include the Loving Sister Earth group which encourages people to visit Ireland’s monastic sites, pilgrim paths and holy wells. The garden also features a grotto dedicated to Our Lady of Lourdes. Sessile oak, our national tree, is being planted in the garden. This particular oak comes from the Columba Community’s garden in Derry. It symbolises the cross-border care for the Earth. This is just one type of tree in the garden which highlights biodiversity in its many grasses, shrubs and flowers. Hedgerows provide vital corridors for biodiversity. There is also a spiral which hints at humans’ common cosmic story. Imogen Stuart has been inspired by the rich heritage of early Irish art to create modern sculptures for the garden. Her pieces for WMOF include Methos: The Angel of Peace, which highlights the belief that good angels have responsibility for humans. Her sculpture The Promise includes two hands making a prayer of gratitude to God who promises to save us from destruction. This piece is also an entreaty to reflect on our environment. A representation of Saint Francis shows him addressing Brother Sun and Sister Moon, as in his canticle, Laudato Si. I and Thou is inspired by a story of solitary confinement in Argentina, where two prisoners could see each other though small peep holes in their steel doors. In this art one can look through the small square and see the eye of the Other – God. 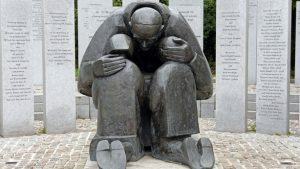 The sculpture Pope John Paul ll is based on his visit to Ireland in 1979 when he was photographed embracing two children. The three heads in the sculpture also hint at the Trinity. Other statues include Madonna: Mother and Child in which the artist shows the Mother’s feelings of tenderness, love and care for her child in the placing of her hands on her child’s shoulders. The Bog Lovers piece shows the artist’s appreciation and concern for nature.